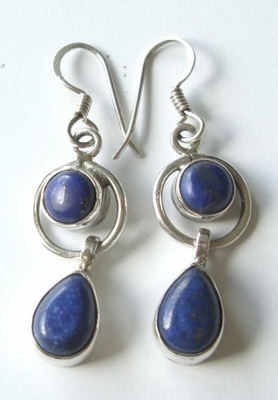 These gorgeous earrings have beautiful deep blue lapiz lazuli stones set in silver. Two lovely stones nice and smooth one round set in silver with another ring of silver surrounding it and a second stone in teardrop shape dangling from the ring of silver. The silver compliments the deep blue of the lapis stones beautifully.